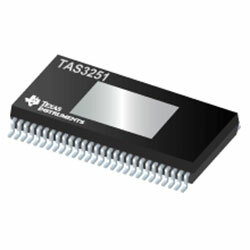 The TAS3251 from Texas Instruments is a digital-input, high-performance Class-D audio amplifier that allows true premium sound quality with Class-D efficiency. The digital front-end highlights a high-performance Burr-Brown DAC with integrated DSP for advanced audio processing, including SmartAmp and SmartEQ. The first high-power single-chip solution reduces overall system solution size and cost. The DSP is supported by the company’s PurePath Console Graphical tuning software for quick and easy speaker tuning and control. The Class-D power stage provides advanced integrated feedback and proprietary high-speed gate drive error correction for ultra-low distortion and noise across the audio band. The device operates in AD-mode and can drive up to 2 x 175W into a 4Ohm load and 2 x 220W into a 3Ohm load.